The Kidizoom action Cam by VTech lets little videographers capture their adventures with videos and photos! the action Cam is a great first video camera for kids and is durable enough to handle drops and tumbles. It can go anywhere and do anything kids can do with two included mounts so they can attach it to their bike, skateboard and more. 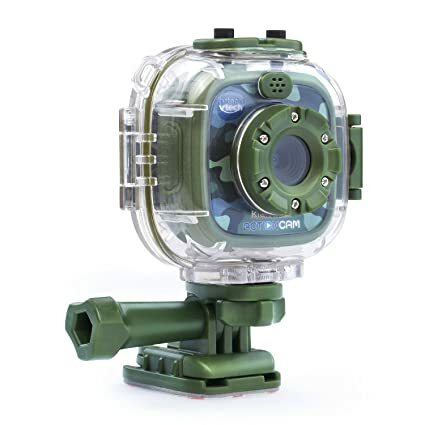 It also comes with a waterproof case so they can take videos and pictures up to 6 feet underwater! 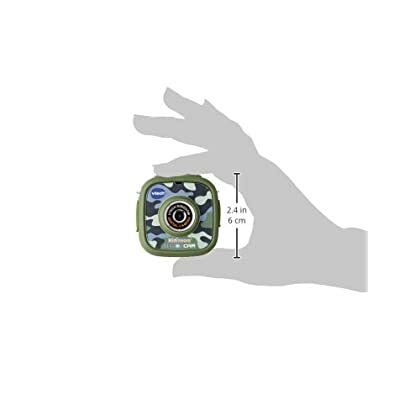 the action Cam features a 1.4-Inch color LCD screen and can take videos and photos in addition to stop-motion videos and time-lapse photos. Your child can also explore their creativity with fun effects, frames and photo filters. They can download their photos and videos to a computer using the included micro USB cable and share them with family and friends. For even more fun, they can also play three exciting learning games. Built-in rechargeable Li-Ion Polymer battery /(approximate continuous photo taking and recording time is 2.5 hours. Battery is not replaceable/). expandable memory /(to store all your adventures, a MicroSD card is required. Sold separately/). ages 4 to 9 years.